This view of the North Concho River is on the North Scenic Loop. Normally, there is a small pond at the bottom of the drop-off. Instead, the water level is much higher; a welcome abundance as it flows to O.C. Fisher Lake. Temps started in low 50's, ended in mid-60's. Cloudy with intermittent breeze from the South. Wet, muddy, rough or rocky - take your pick and one or more of those descriptions fit the trail conditions on today's hike. We had a week of welcome rain which brought a much needed boost to the lakes and reservoirs; O.C. Fisher (at the park) went from 7.9% to 14.3 % - not much of a difference to many but a BIG improvement to the lake. 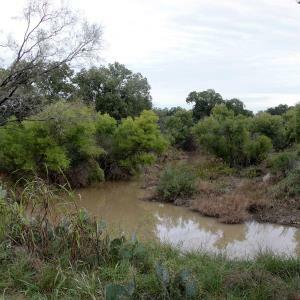 The North Concho River, which feeds the lake, for the longest time was dry in many places and was not flowing but today, it is flowing and adds even more water to the lake. The rains have also helped the migrating Monarchs (I saw many individuals but no large groups) by causing the Bee Brush to bloom once more. Lots of other butterflies were present as well, all feasting on the numerous small flowers present. I saw about 20-25 Whitetail deer during the hike and for the first time, an American Badger. I was walking along Javalina Trail on my way to Cougar Lookout and as I rounded a small bend, I saw a badger about 20 yards in front of me. I began to raise my camera and as I did, he ducked into a patch of prickly pear. I waited a minute to see if he'd come back out but he didn't. I walked slowly past and stopped about 20-30 yards away and waited. After another minute, the badger cautiously lifted his head up and peered at me while he remained in the midst of the prickly pear. After a few seconds, he turned and disappeared in the brush - all I saw was the top portion of his body as he scurried away. The photo I took of him watching me from the brush wasn't worth much and I discarded it. Oh well, next time I'll get a good photo. Water available at Bell's Trailhead in the camping area. Water, shade, info kiosk and dry toilets available at River Bend Campground. Shade, info kiosk and bicycle repair station available at Cougar Lookout. Water, shade and info kiosk available at Dinosaur Tracking Viewing Area. SPECIAL NOTE - On the return leg, when I came down the service road from the Badlands Trail, there is a junction of trails at the base of the hill. The iron post trail signage says "North Slick Rock" BUT when you reach the end of the trail, there is a wooden sign that says the trail you just traversed is "Dinosaur Trail". This can be misleading. ALSO - The park has updated their paper maps but have not yet updated the maps in the info kiosks.